The ultrasonic durometer is a device, based on a patent filed in 1961. Therefore the hardness measurement is performed through a diamond placed on a spring. Due to its design and measurement method, the ultrasonic durometer allows a simple and non-destructive analysis of metallic objects. The ultrasonic durometer enables measurements on various construction parts, since it is programmed to measure with different SI-units, the most common of which are the hardness scales according to Rockwell, Brinell and Vickers. Featuring a RS-232-interface the ultrasonic durometer PCE-5000 can be connected to a computer in order to read out and print out the measured data. The ultrasonic durometer allows a detailed overview of all the data, since it can record even the thresholds as well as mean values. The mean value is automatically generated as soon as more than one measurement is performed with the ultrasonic durometer PCE-5000. Its design allows reaching even locations that would be otherwise hard to reach, and it allows reviewing and reading the values comfortably at its graphic display. Due to an option to calibrate, the ultrasonic durometer can be always calibrated by the user at any time. 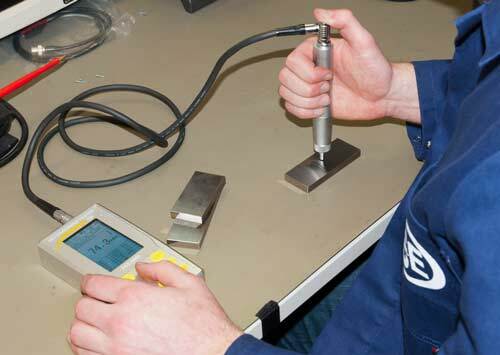 A calibration might be necessary, if for example the last measurement was more than three months back, or when the environment is significantly different from before, if the ultrasonic sensor has already performed a major amount of measurements, or if the measurement of a defined calibration object shows a divergent. If you should have more questions regarding the ultrasonic durometer PCE-5000, please read the following technical data, use our contact form or call us: UK customers +44(0) 23 809 870 30 / US customers +1-410-387-7703. Our technicians and engineers will gladly advise you regarding the durometers or any other products in the field of Control Systems, Laboratory Equipment, Measuring Instruments or Scales and Balances of PCE Instruments Ltd. 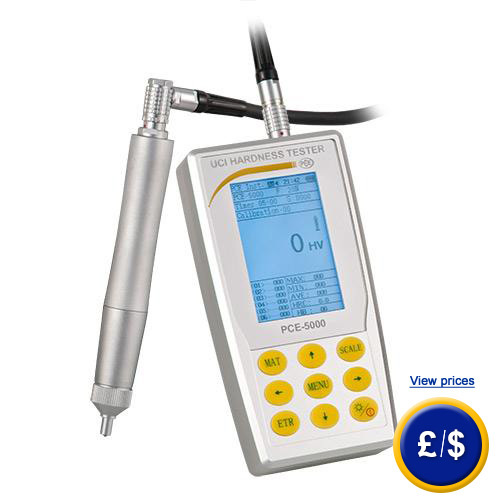 The ultrasonic durometer PCE-5000 features a large LCD, so the values can be read out clearly. Additionally a 1.5 m cable connecting the sensor with the device allows reaching spots, that would be otherwise hard to reach. Here you can see the measurement of metal by the ultrasonic durometer. 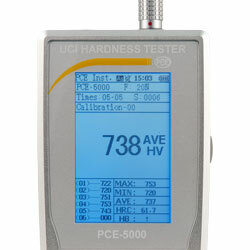 The large display of the ultrasonic durometer PCE-5000 makes reading the values easy and comfortable. As you can see, the ultrasonic durometer features a long cable, which allows reaching spots, that would be otherwise hard to reach. For companies that want to admit their ultrasonic durometer to their internal pool of test devices or for annual calibration. 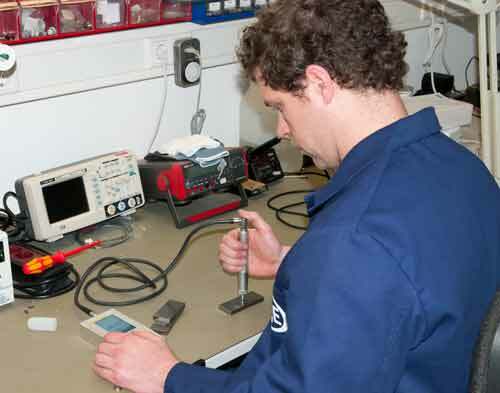 The certification in accordance to ISO includes a lab-calibration and a certificate with all measuring values. The name of the ordering company / the contact information of the purchaser will also be entered into the report. 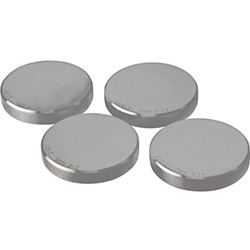 Additional measuring sensors can be connected to the ultrasonic durometer, which diverge in their test force, which is applied to measure the hardness. The different sensors measure the hardness of the objects depending on the roughness of their surface. For example the standard sensor with 20 N measures surfaces with a roughness of less than 5 µm. 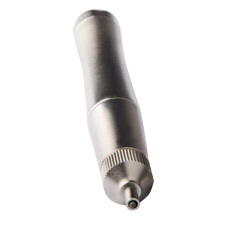 The 10 N sensor measures a roughness of less than 3.2 µm and the one with 98 N measures a roughness of less than 15 µm. 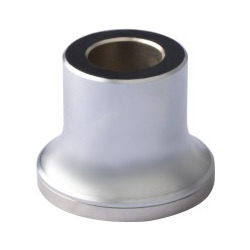 The support rings of the ultrasonic durometer are to attach to the sensor and thus allow testing different kinds of surfaces. 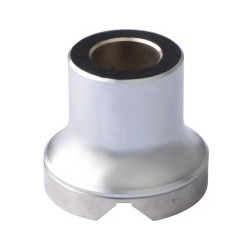 In order to guarantee a high accuracy of the ultrasonic durometer, there are various calibration blocs purchasable, which facilitate a calibration of the device.